Jet lag is still affecting us as I was wide awake at 4AM this morning. 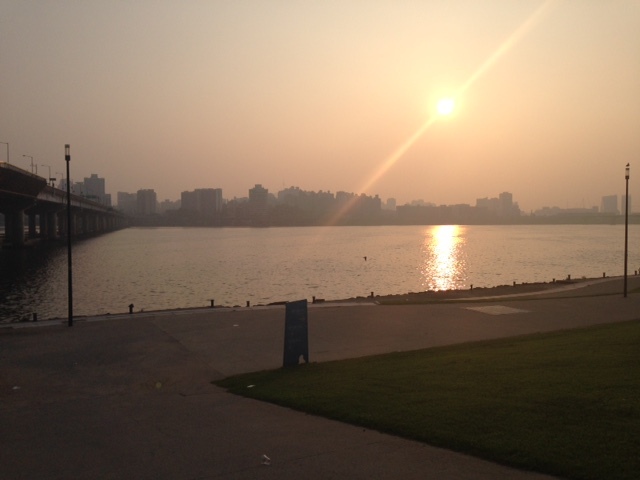 Oh well, Clint got up a little after 5 and we took our time and decided to go for a run down by the river. On the subway we discovered that there was also a bike race happening and all the bikers got off at the same station that we did and their check in point was at the same park that we were going to go running in. It was funny to see them try and carry and get their bikes up the escalators. We had a good run, the sun was working its way up but not yet too hot and there were huge dragon flies flying everywhere. We made it back to our room and got ready and then called and talked with the boys for a bit and found out that they are having a ton of fun without us. 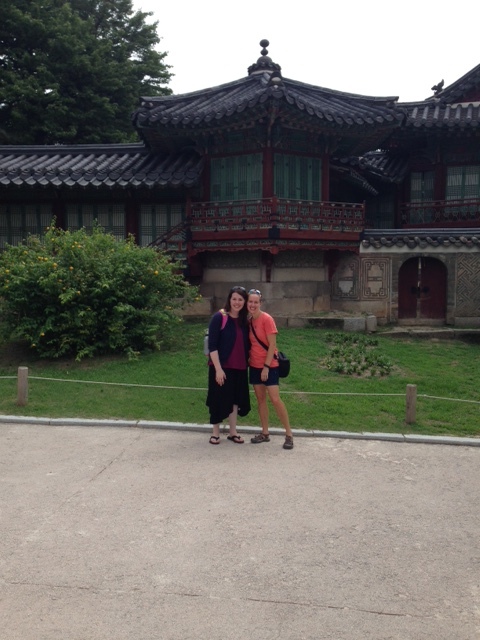 After our phone call we headed out to meet up with a fellow adoptive family at Changdeokgung which is the Palace of Illustrious Virtue. It was built in the early 1400s and had to be rebuilt after being destroyed in the late 1500s. It was the primary royal residence through the 1800s and still used into the 1900s. 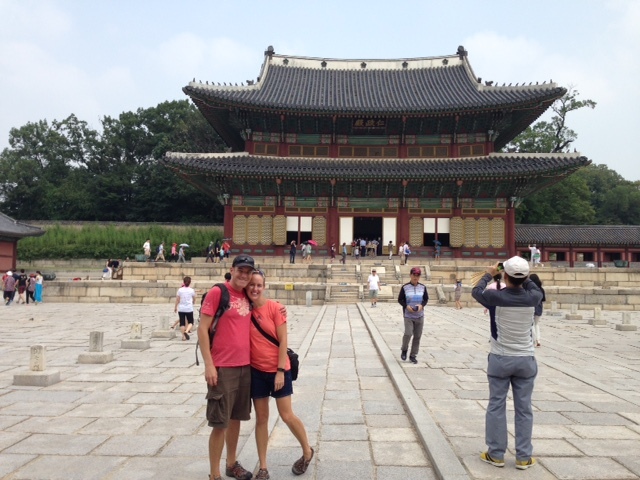 We walked around the main part of the palace for a bit. 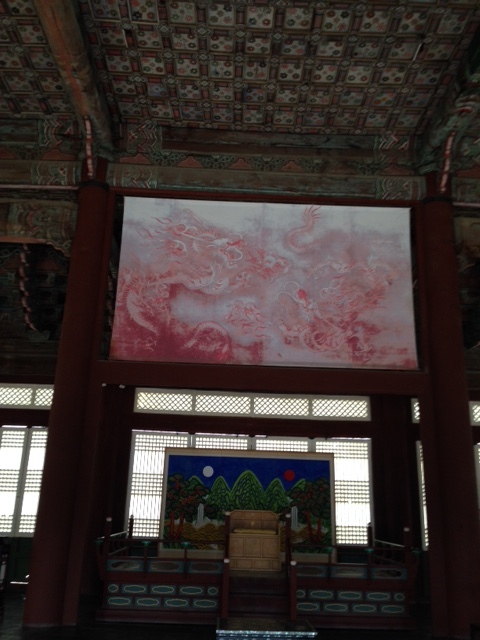 The ceilings are very intricately painted and beautiful. There were a lot of people at the palace because today is the 70th anniversary of Independence from Japan. As part of the celebration of Independence all the palaces were free to the public today. 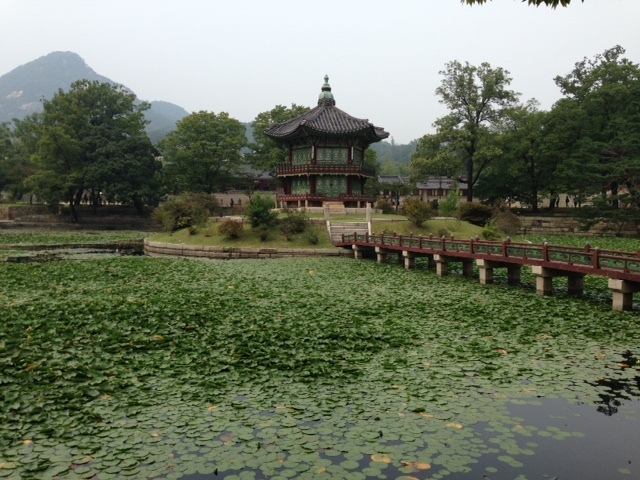 Changdeokgung also has a secret garden (that was not free), but that I had read about and so we reserved tickets for it a month or so ago and with our friends Rachel and Robert went on the tour of that. The tour lasted about 90 minutes and it was gorgeous. It was also VERY VERY HOT and HUMID. This Colorado girl is having a little issue with the humidity, I honestly don’t know how people survive humidity. 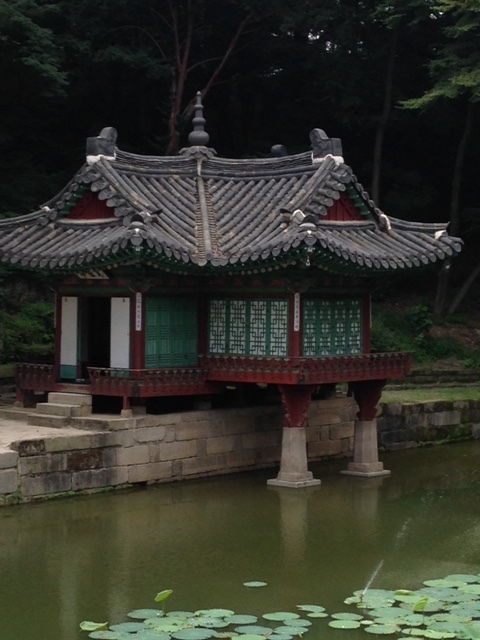 It feels like all my skin melted somewhere inside of Changdeokgung and there is just a big puddle of me that will be forever there and likely become part of the tour “And here is a puddle of what was a silly Colorado girl who didn’t know what humidity was all about”. Luckily Rachel’s hotel was close by and so we went and sat in the air conditioning for awhile after the tour was over and that was glorious. For lunch we were just a few steps away from Insadong and so we went back to that market and found the chicken kabobs place again. Clint also found something which was dough stuffed with goodness, he had sweet potato and I had pizza flavored. And then Rachel introduced us to some yummy goodness that were kind of like a doughnut that was flat and had melted cinnamon on the inside. They were amazing. 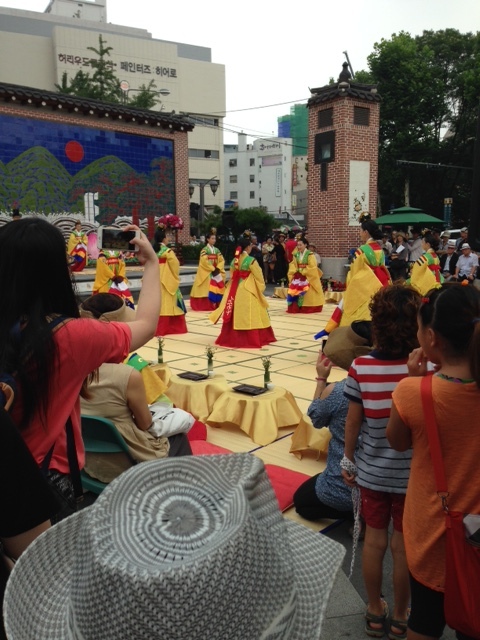 In one of the plazas near the market there were some people doing traditional Korean dances. There were some traditional We wandered through the market for awhile and then decided to go check out the other palace. 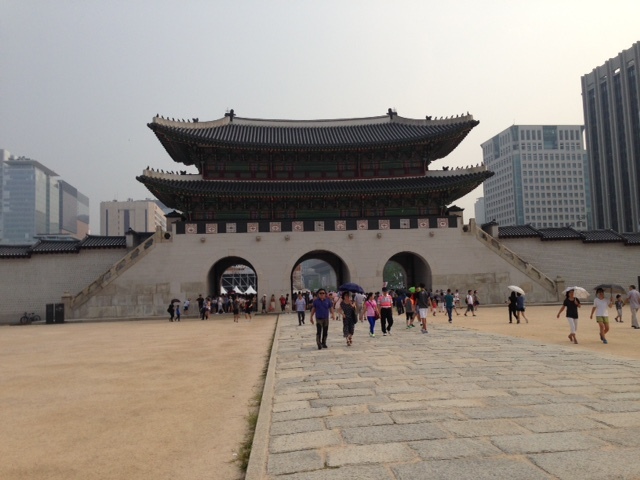 As we approached Gyeongbokgung, we saw busses full of policemen all along the road. We discovered later that they were there for all the Independence celebrations. The palace was also free to the public today. It was massive, which was good because there were a ton of people there. The ceilings were again magnificent. 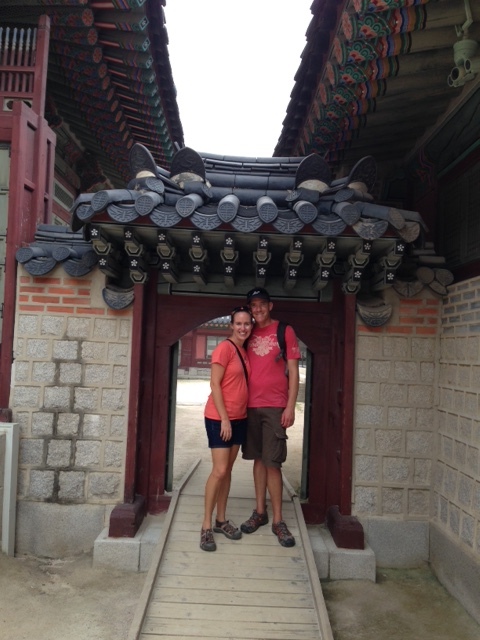 We walked back to the back of the palace grounds where Hyangwonjeong Pavillon was located. 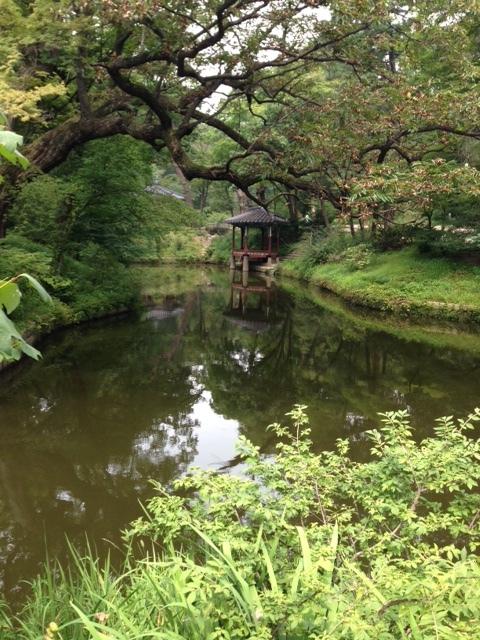 I had seen a number of photos with that pavilion but it was so amazing to see it in real life. At that point in the afternoon, what little skin had not melted off in the first palace was quickly melting off of me and we spotted the History Museum along the side of the palace and all but ran there hoping they had air conditioning. They in-fact did and so we spent quite a bit of time in the museum looking at the displays and cooling off. 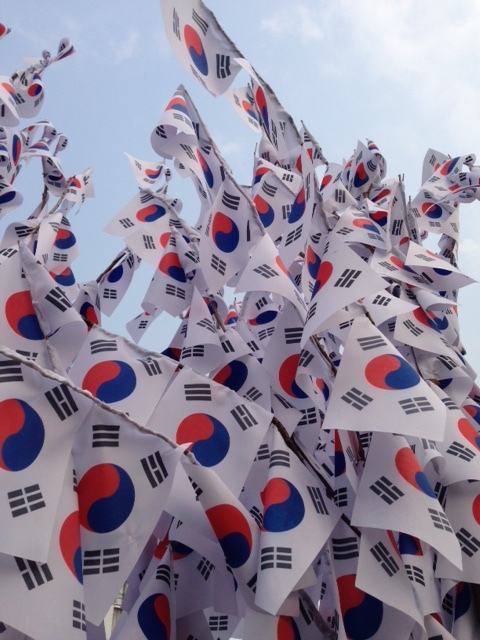 As we headed out of the palace there were a number of flags set up and a large festival plaza set up across the road. We crossed and walked through the festival and got to see the trees that were decorated with flags. We made it back to our room eventually and then decided that we should have cake for dinner, because why not?